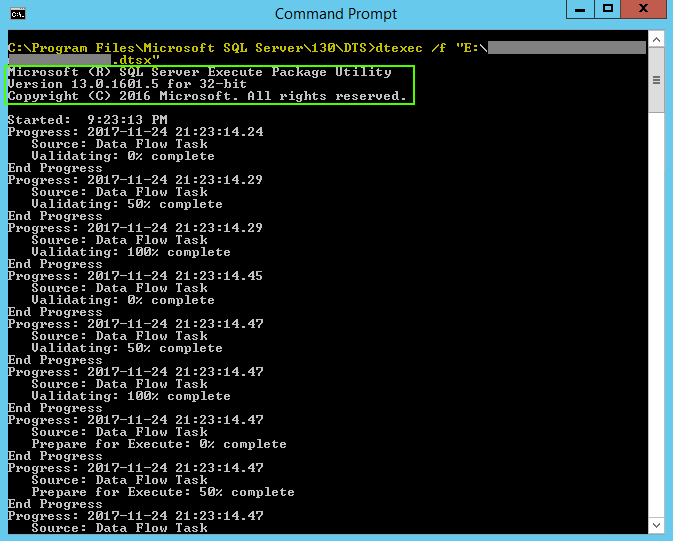 The dtexec command prompt utility is used to configure and execute SQL Server Integration Services packages. The dtexec utility provides access to all the package configuration and execution features, such as connections, properties, variables, logging, and progress indicators. The dtexec utility lets you load packages from three sources: a Microsoft SQL Server database, the SSIS service, and the file system. (Optional). Loads a package that is saved in the file system. The filespec argument specifies the path and file name of the package. You can specify the path as either a Universal Naming Convention (UNC) path or a local path. If the path or file name specified in the filespec argument contains a space, you must put quotation marks around the filespec argument. The /File option cannot be used together with the /DTS or /SQL option. If multiple options are specified, dtexec fails. C:\Program Files\Microsoft SQL Server\130\DTS>dtexec /f "E:\*****.dtsx"
For DTSX in SQL Jobs, you can test using a new Proxy Account and execute the .DTSX step in the SQL Job as that Windows User. First create a new Credential and then a SQL Agent Proxy. 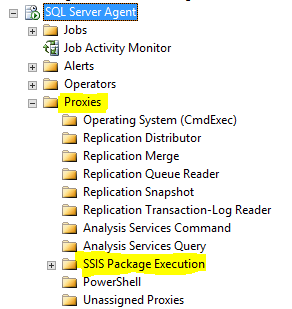 Many times if the SSIS Package is executing, but not progressing, a re-start of the SQL Agent may fix it.